Here’s the info card with the theme and product list for the month. Mazi is a great brand that creates handmade, eco-sustainable products with help from Turkish artisans. This tie dye towel is about the size of a dishtowel, but it’s significantly softer than the cotton dishtowels I’ve gotten in the past. This little pouch of bath salts smells like a rich floral tea. The best part about it is the luminous blend of purple, pink, and blue salt crystals, which add a fairy tale quality to the tub. This shimmering teal polish is infused with obsidian, which the Love by Luna site calls detoxifying and truth-enhancing. I love the pigment and deep-ocean hue of this vegan, cruelty-free, and 5-free formula! It’s dramatic and intriguing. My hair is naturally wavy and piecey, so I didn’t notice a huge change in texture after using this spray. That said, it did leave a halo of fresh, pretty fragrance around my hair, and the aloe and coconut oils left my hair feeling rather nourished. I love a plant-based protein bar! This one is powered by spirulina, which is an algae rich in protein, B-vitamins, and antioxidants. While the color is bright vibrant teal, the flavor is mostly dominated by the almonds in it, plus a pop of something kind of acidic and zesty—at first I thought there was apple cider vinegar in the mix. I love the summer sun, but it can be quite a burden on my skin. Not just because of the sunlight, but all the sunscreen and moisturizer that goes into caring for summer skin. So I love having this set of natural sponges to help buff my tired skin after a long day. The only odd thing about them is that they smell subtly wheaty, but that’s because of their natural composition. I really appreciate that this kit comes with a suction cup hook for storing the sponges between uses! There’s usually a crystal of some sort in this box, and this month, it’s this swirling blue and white sodalite stone. It’s about an inch or so cubed, so it’s easy to toss in a pocket or display subtly on a shelf. The card says that this stone promotes peace and tranquility. Looking at it, I feel like I’m looking at a planet! The Verdict: I liked this month’s theme, which felt like the Goddess Provisions version of a beach-themed summer box. All of the finds revolved around water or the ocean somehow, so it felt cohesive. I’m most excited about my new tea towel, though the facial sponges are awesome, too. 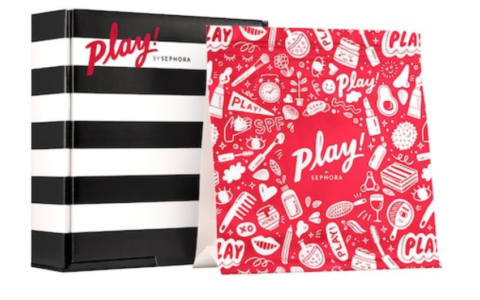 This is a great box for discovering new products and brands, particularly if you’re looking for vegan or more natural options. Can you still get this box if you sign up today? Sign up now for the July box. Some past boxes do end up for sale here! $10 off with code FLOW through 8/28. It was in my email. I would love to swap for the nail polish and the sodalite. My swap ID is melissab. I hope we can set something up!